We would like to introduce ourselves as an ISO certified manufacturers and suppliers of equipment's for Modular Operation Theatres. We do not do the assembly of Modular Operation Theatre. 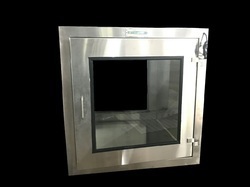 Static Passboxes are used in operation theatres and other clean rooms. These static pass boxes are installed in manufacturing areas and filter the incoming air in order to keep the air free from dust and other contaminants. With UV light along with hour meter, Fluorescent light, buzzer indicator to know the material is kept inside and indicating lamp, these static pass boxes provide excellent working performance in the clean room unit. The magnetic writing board for the clean rooms is used for writing down information by doctors / technicians. The information might be the list of instruments / implants or how the operation needs to be performed. The magnetic writing board is flushed into the Clean room wall. Which makes the Clean room seamless and does not permit dust or any particles to enter the clean room from the joints. 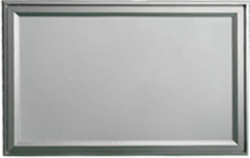 The board is also coated with an antimicrobial coating making it useful for all clean rooms. Because of the magnetic property the magnetic duster and the magnetic marker can be stick directly on the writing board and you do not need to keep the marker and the duster hence making it extremely useful for all clean room applications. We manufacture Single, Double and Triple scrub sink station Manual, IR operated, Knee Operated and foot switch operated scrub sink made from high quality stainless steel ss 304 having electronic or manual taps with thermostatic controller which can be floor or wall mounted. 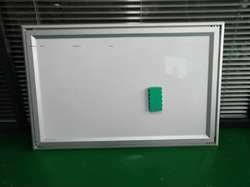 We are the leading manufacturer of Magnetic-Writing Board.